What’s five feet tall and weighs 400 pounds, shaped like a cross between an egg and a bullet, and ready to stop crime at one local animal shelter? 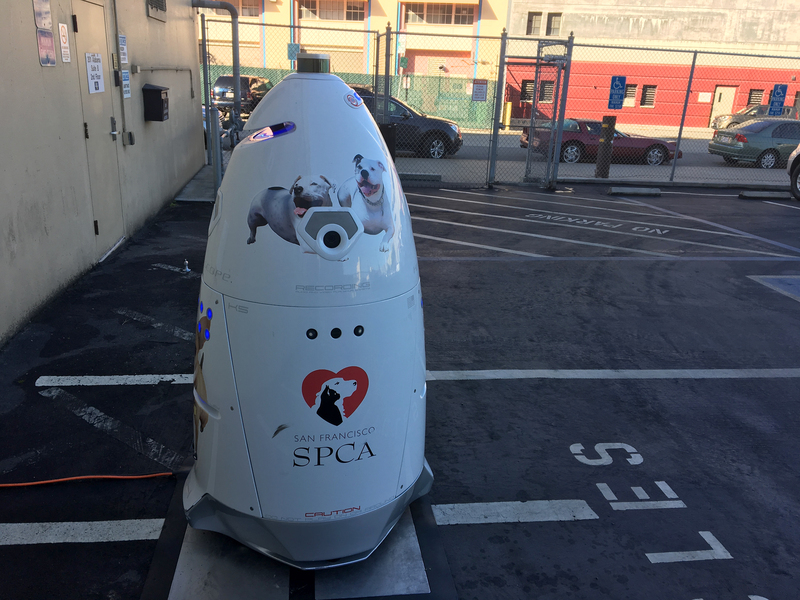 “K9” is a Knightscope security robot now on duty at the San Francisco SPCA. To eliminate any confusion about where it belongs, it’s emblazoned with pictures of happy animals. One animal, though, was not happy to see the bot: Ginger, a 60-pound dog belonging to local transit advocate Fran Taylor. The machine stopped five or six feet away from Taylor, as she restrained her dog and shouted at nearby SPCA staff members to get it off the sidewalk. Then it retreated out of sight. “This robot was a total invasion of our space on the public sidewalk, and we were shocked that the SPCA of all places would be so insensitive to both the rights of pedestrians and the needs of the often traumatized dogs that typically fill that particular sidewalk,” Taylor wrote to the SPCA following her encounter. The nonprofit started trying out the security bots a few weeks ago in response to break-ins and graffiti that had risen in recent years. It’s working, according to Krista Maloney, the SPCA’s spokesperson. There’s been a “significant decrease” in graffiti, car break-ins and encampments around their parking lot. In case you were wondering — yes, this is the same kind of robot that has in the past knocked over a toddler at a Palo Alto mall and drowned itself in a fountain in D.C. Even Knightscope, the producer of the robots, insists on its website that they will never replace human security guards. The SPCA also employs two human security guards. Knightscope also indicates in its online materials that the bots are rented — for $7 an hour, far less than you’d pay a San Francisco human, hopefully — by the pair, so that one can trundle about recording while the other charges. The SPCA only has one, and it was in a placid state when I encountered the new pet protector. Now it presumably has some nice video of me making befuddled faces and muttering about the robot conspiracy, since pretty much every part of the machine bears warnings that it is recording video and taking photos. Every part, that is, not taken up by cameras and lights or photos of cats and dogs. They look happy, but I wasn’t exactly reassured. Being recorded is more or less part of life and, since I’m a reporter, I do it to other people all the time, so I can hardly complain about being filmed when I stick my face in a camera. But what else was it doing, I wondered. Was it scanning me somehow? Did my staring equate to some kind of sentient surveillance faux-pas? What if I wake it up? Does it even sleep? Does an animal shelter guard robot dream of electric sheep (or real puppies)? Paranoia aside, what the robot does do, according to its manufacturer, is primarily gather audio and visual data. It can also scan and remember license plates and notify clients if a flagged plate appears in the parking lot. Oh, and it hums as it works, a strange ambient whirring — a robot ditty — as it scoots along at three miles an hour. Taylor shared a video shot by another dog owner, Dave Golinski, and his encounter with the Knightscope. In it, he does exactly what I wanted to do, but in the end didn’t: He says hello to the robot. There’s no response. Rude! The other outstanding question is whether City Hall will intervene. Folks there have been working on some legislation to keep sidewalks for people and pets only. Taylor, who has been a supporter of that legislation by District 7 Supervisor Norman Yee’s staff, says it currently makes no specific provision for security robots, only delivery ones. The SPCA has affectionately named its robot “K9.” As the other canines inside depart for new homes, perhaps this one is here to stay. NextFire erupts and displaces 11 tenants from buildings on Shotwell St. I give it 2 days till someone poops on it.